Wasps are members of the order Hymenoptera, suborder Apocrita. Members of this order, which includes bees, yellow jackets, hornets, and ants, are found in all 50 states. Western paper wasp (Mischocyttarus flavitarsis) building a nest. By Sanjay Acharya (self-made at Sunnyvale, California, USA). Courtesy of Wikimedia Commons. Wasps can be further divided into social wasps and solitary wasps. Social wasps include the aggressive wasps found in northern temperate regions, such as the yellow jacket (black and yellow bands on abdomen) and the hornet (mostly black with yellow markings on the face and thorax). Social wasps live in colonies that may contain from a dozen to many hundred mature insects. The colonies can range in size and position from the underground nest of the yellow jacket, which is found in rotted tree stumps and mammal burrows, to the hornet's paper nest that hangs from shrubbery, trees, or is plastered to the side of a shed or house. Solitary wasps acts as a predator feeding on smaller insects and bringing the paralyzed prey back to its nest for its young. Solitary wasps include the mud wasp, which makes its nest in crevices of windows. More than 25,000 species of wasps exist worldwide. They include yellow jackets, which are members of the genus Vespula and are large and aggressive. The female yellow jacket begins to construct her nest in the springtime. 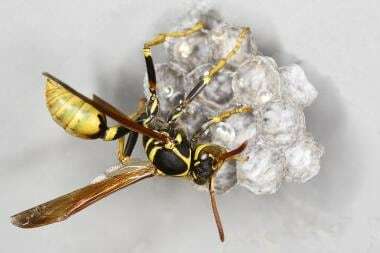 The nest is composed of a paperlike substance that wasps regurgitate from chewed wood or plant material. The nest consists of multiple vertically oriented cells, with the opening on the bottom of the nest. Envenomation or stings by members of the order Hymenoptera is a major cause of morbidity and mortality and accounts for more fatalities than any other venomous animal. The skin is the most commonly affected organ system. The result of a wasp sting can vary from a single area of localized inflammation to a generalized urticarial rash. Yellow jacket. By Richard Bartz, Munich aka Makro Freak (Own work). Courtesy of Wikimedia Commons. Upon penetration of the skin, the muscles around the wasp's venom sac begin to inject the venom. Wasp venom contains up to 13 different antigens. 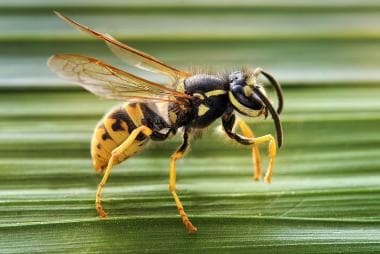 The wasp sting first causes an intense stinging sensation that is believed to be mediated by the presence of acetylcholine and serotonin, which make up to 5% of the dry weight of the venom. The acetylcholine causes an intense depolarization of the nociceptors within the dermis. The serotonin causes multiple effects through the 5-hydroxytryptamine (5-HT) receptors, including an intense localized vascular spasm. For individuals who have been sensitized to the venom by a past exposure to Hymenoptera venom, symptoms may progress. This progression involves elements of both cellular and humoral immunity. The cellular components consist of lymphocytes, both T cells (CD4+ and CD8+) and B cells, macrophages, and mast cells. The humoral factors include immunoglobulin E (IgE) and cytokines. The process begins with sensitization. This occurs after the protein peptide moieties in the wasp venom, the allergen or immunogen, are processed by antigen-presenting cells, such as macrophages, to form major histocompatibility complex molecules located on the cell wall. This complex is then presented to the T-cell receptor (TCR) on the CD4+ cells. This is followed by the production of IgE and ends with the binding of IgE to the high-affinity receptor, designated FcRI, on the mast cells. An immediate type of hypersensitivity occurs when the sensitized mast cells contact the offending immunogen. The mast cells become activated, causing solubilization and enlargement of the crystalline granules within their cytoplasm. This is followed by degranulation with the release of these chemical mediators, which include histamine, heparin, and tumor necrosis factor (TNF), into the surrounding tissue. In addition to degranulation, mast cell activation also initiates generation of bioactive products through lipid metabolism of arachidonic acid and the production of cytokines such as TNF, interleukin (IL)–6, IL-4, and IL-5. The nature and degree of the immediate hypersensitivity reaction depends on the location and the degree of activation of the mast cells. Mast cells are located in the connective tissue of the dermis, GI tract, airway, and lungs and around the vascular system, thus producing the symptoms discussed below. Urticaria, which has also been termed "anaphylaxis of the skin", typically presents as raised pruritic erythematous wheals. Urticaria develops because of the presence of activated mast cells in the connective tissue of the dermis with the production of chemical mediators, such as histamine, that increase local vascular permeability. In general, localized vasculitis is thought to be caused by several factors. IgE triggers the release of vasoactive amines (eg, histamine, bradykinin, leukotrienes) from platelets or from mast cells, increasing vessel wall permeability. The antigen-antibody complexes also result in the activation of complement components, particularly plasmin-activated complement 5 (C5a). The C5a then causes neutrophilic infiltration of the vessel wall to phagocytose the immune complexes. The release of intracytoplasmic enzymes further damages the vessel wall. Systemic symptoms can include nausea, vomiting, abdominal cramping, and diarrhea due to mast cell activation in the GI tract. Coughing, dyspnea, and wheezing can occur after mast cell activation in the airway. Anaphylactic shock is an immediate-type hypersensitivity reaction that occurs when mast cells are activated within multiple organ systems and vascular collapse occurs. This is an IgE-mediated reaction to the sting. Six percent of blood donors are estimated to have elevated IgE levels to Hymenoptera venom. In one study of postmortem sera from patients with sudden death, 23% had elevated levels to Hymenoptera venom. As a rule, the severity of the response can be estimated by how quickly it occurs after the sting. Most fatalities occur within 1 hour, with most severe reactions occurring within 10 minutes of the wasp sting. This is more related to the existing level of circulating IgE than to the number of wasp stings or the amount of venom injected. In the general population, 3% of adults and less than 1% of children have systemic reactions. This is probably because adults are more likely to have developed sensitization from a prior wasp sting. Wasp stings are more common in males than in females, likely because of increased occupational and recreational exposure in men. More reported wasp stings occur in adults than in children. Children tend not to have reactions as severe as those in adults, possibly because adults tend to have had more opportunity to have developed sensitization to the allergens in the venom. However, a recent article also suggests that serum tryptase is a risk factor for severe anaphylactic reactions. Serum tryptase levels increase with age and seem to correlate with mast cell load or reactivity. When a child develops an allergic reaction to a wasp sting, it tends to be worse than an adult’s reaction because of the higher ratio of venom quantity to body mass. The prognosis for mild-to-moderate reactions is good. The goal is prevention of another exposure. The anaphylactic reaction begins with the onset of symptoms distal to the wasp sting. The patient frequently feels increased anxiety, lightheadedness, headache, nausea, abdominal cramps, and palpitations. This is followed by objective findings of the patient appearing flushed, hypotensive, and tachycardic. This is due to the circulating levels of histamine and kinins that cause decreased systemic vascular resistance, increased capillary permeability, and resulting reduction of intravascular volume. The resulting reduction in perfusion pressure causes the neurologic symptoms of lightheadedness, syncope, and seizures. Sensitization to Hymenoptera or wasp venom occurs in almost 1% of all stings. Each year, 90-100 deaths occur. Risk factors that tend to increase morbidity and mortality include age, cardiopulmonary risk factors, medication, and prior history of an allergic reaction to a Hymenoptera or wasp sting. Factors that favor a systemic reaction include multiple simultaneous wasp stings or single sequential wasp stings within several weeks. In most cases of Hymenoptera stings, death is the result of airway and respiratory compromise. Edema of the larynx, epiglottis, and supraglottic area is found in 69% of fatal cases. These structures are particularly vulnerable target areas because of their rich vascular supply. Prior history of sensitivity or an allergic reaction to a Hymenoptera sting places the patient at higher risk for another reaction. Children and elderly people are at increased risk. Infants and small children are at risk after multiple wasp stings because of the relatively large amount of venom per body mass. The smaller-diameter pediatric airway may also occlude more readily from edema. Elderly people may have poor cardiac reserves to compensate for the allergic reaction. People with coronary artery disease, a history of ischemia, prior myocardial infarctions, or reduced cardiac ejection fractions may not be able to compensate for the increased insult to their circulatory system from circulating vasoactive peptides or from the catecholamines administered to resuscitate them. People with pulmonary disease (eg, asthma, chronic bronchitis, emphysema) may experience acute decompensation of the respiratory system because of increased bronchospasm or pulmonary edema. Beta-blockers may increase morbidity and mortality because they inhibit attempts to improve cardiac output by either endogenously produced or exogenously administered catecholamines. Calcium channel blockers may exacerbate the reduced systemic vascular resistance caused by circulating vasoactive peptides. The vasodilating antihypertensive agents may blunt the body's physiologic response to hypotension. As the circulating vasoactive chemical mediators of anaphylaxis cause vasodilation, the systemic vascular resistance falls. This causes a subsequent drop in the glomerular filtration rate, resulting in increased activation of the renin-angiotensinogen-angiotensin system. Angiotensin-converting enzyme (ACE) inhibitors and ACE receptor blockers, as well as other vasodilators, can interfere with the body's ability to increase vasoconstriction and increase the systemic vascular resistance and the blood pressure (BP). The effect that nonsteroidal anti-inflammatory drugs (NSAIDs) and leukotriene inhibitors may have in modulating the severity or the morbidity and mortality of Hymenoptera-induced allergic reactions is unclear. Teach the patient how to modify behavior, to dress, and to use toiletries and perfumes appropriately. Starr CK. A simple pain scale for field comparison of Hymenoptera stings. J Entomol Sci. 1985 April. 20:225-31. Pumphrey RS, Roberts IS. Postmortem findings after fatal anaphylactic reactions. J Clin Pathol. 2000 Apr. 53(4):273-6. [Medline]. Nittner-Marszalska M, Cichocka-Jarosz E. Insect sting allergy in adults: key messages for clinicians. Pol Arch Med Wewn. 2015 Sep 3. pii: AOP_15_083:[Medline]. Forrester JA, Holstege CP, Forrester JD. Fatalities from venomous and nonvenomous animals in the United States (1999-2007). Wilderness Environ Med. 2012 Jun. 23(2):146-52. [Medline]. Guenova E, Volz T, Eichner M, Hoetzenecker W, et al. Basal serum tryptase as risk assessment for severe Hymenoptera sting reactions in elderly. Allergy. 2010 Jul. 65(7):919-23. [Medline]. Diaz JH. The impact of hurricanes and flooding disasters on hymenopterid-inflicted injuries. Am J Disaster Med. 2007 Sep-Oct. 2(5):257-69. [Medline]. Vachvanichsanong P, Dissaneewate P. Acute renal failure following wasp sting in children. Eur J Pediatr. 2009 Aug. 168(8):991-4. [Medline]. Rekik S, Andrieu S, Aboukhoudir F, Barnay P, Quaino G, Pansieri M, et al. ST Elevation Myocardial Infarction with No Structural Lesions after a Wasp Sting. J Emerg Med. 2009 Mar 26. [Medline]. Jairam A, Kumar RS, Ghosh AK, Hasija PK, Singh JI, Mahapatra D, et al. Delayed Kounis syndrome and acute renal failure after wasp sting. Int J Cardiol. 2008 Aug 13. [Medline]. Sun Z, Yang X, Ye H, Zhou G, Jiang H. Delayed encephalopathy with movement disorder and catatonia: A rare combination after wasp stings. Clin Neurol Neurosurg. 2012 Dec 21. [Medline]. Ito K, Imafuku S, Nakayama J. Rhabdomyolysis due to Multiple Wasp Stings. Case Rep Dermatol Med. 2012. 2012:486724. [Medline]. [Full Text]. Nandi M, Sarkar S. Acute kidney injury following multiple wasp stings. Pediatr Nephrol. 2012 Dec. 27(12):2315-7. [Medline]. Barach EM, Nowak RM, Lee TG, et al. Epinephrine for treatment of anaphylactic shock. JAMA. 1984 Apr 27. 251(16):2118-22. [Medline]. Brown SA, Seifert SA, Rayburn WF. Management of envenomations during pregnancy. Clin Toxicol (Phila). 2013 Jan. 51(1):3-15. [Medline]. EpiPen EpiPen JR [package insert]. NAPA California: Dey. 2009. Ruëff F, Przybilla B. Venom immunotherapy. Side effects and efficacy of treatment. Hautarzt. Mar 2008. 59(3):200-5. [Medline]. Ludman SW, Boyle RJ. Stinging insect allergy: current perspectives on venom immunotherapy. J Asthma Allergy. 2015. 8:75-86. [Medline].